Summary: I’m building a calculus course from the ground-up focused on permanent intuition, not the cram-test-forget cycle we’ve come to expect. Just look at the results. The vast majority of survivors, the STEM folks who used calculus in several classes, have no lasting intuition. We memorized procedures, applied them to pre-packaged problems (“Say, fellow, what is the derivative of x2?”), and internalized nothing. Want proof? No problem. Take a string and wrap it tight around a quarter. Take another string and wrap it tight around the Earth. Ok. Now, lengthen both strings, adding more to the ends, so there’s a 1-inch gap all the way around around the quarter, and a 1-inch gap all the way around the Earth (sort of like having a ring floating around Saturn). Got it? Quiz time: Which scenario uses more extra string? Does it take more additional string to put a 1-inch gap around the quarter, or to put a 1-inch gap around the Earth? Think about it. Ponder it over. Ready? It’s the… same. The same! Adding a 1-inch gap around the Earth, and a quarter, uses the same 6.28 inches. And to be blunt: if you “learned” calculus but didn’t have the answer within 3 seconds, you don’t truly know it. At least not deep down. Now don’t feel bad, I didn’t know it either. Only one engineer in the dozens I’ve asked came up with the answer instantly, without second-guesses (my karate teacher, Mr. Rose). Algebra Robot: Calculating change in circumference: 2*pi*(r + 1) - 2*pi*r = 2*pi. They are the same. Calculation complete. Calculus Disciple: Oh! We know circumference = 2*pi*r. The derivative is 2*pi, a constant, which means the current radius has no impact on a changing circumference. We can be calculus warrior-monks, cutting through problems with our intuition. Notice how the most advanced approach didn’t need specific equations — it was just thinking about the problem! Equations are nice tools, but are they your only source of understanding? How Can We Make Learning Intuitive And Interesting? The “start-to-finish” approach seems official. Orderly. Rigorous. And it doesn’t work. 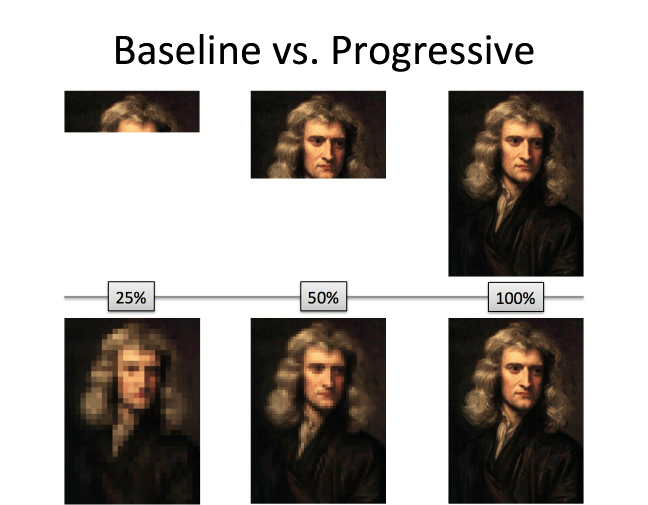 What, exactly, do you know when you’ve seen the first 20% of a portrait in full resolution? A forehead? Do you even know the gender? The age? The teacher has forgotten that you’ve never seen the full picture and likely can’t appreciate that you’re even seeing a forehead! Progressive rendering (blurry-to-sharp) gives a full overview, a rough approximation of what the expert sees, and gets you curious about more. After the overview, we start filling in the details. And because you have an idea of where you’re going, you’re excited to learn. What’s better: “Let’s download the next 10% of the forehead”, or “Let’s sharpen the picture”? Let’s admit it: we forget the details of most classes. If we’ll have a hazy memory anyway, shouldn’t it be of the entire picture? That has the best shot of enticing us to sharpen the details later on. How Do We Know If A Lesson Is Any Good? With the Pizza Box Test. Imagine you pass a dumpster while walking home. You see a message scrawled on a discarded pizza box. Is the note so insightful and compelling that you’d take the pizza box home to finish reading it? Ignore the sparkle of a lesson being digital, mobile-friendly, gamified, interactive, or a gesture-based hologram. Would you take this lesson home if it were written on a pizza box? If yes, great! Clean it up and add in the glitz. But if the core lesson is not compelling without the trimmings, it must be redone. Yo! Imaginary numbers are another dimension, and multiplication by i is a 90-degree rotation into that dimension! Two rotations and you’re facing backwards, aka -1. How Do We Know What’s Best For The Student? By focusing on what future-you would teach current-you. Use the shortest lessons possible. There’s no word count to meet. The same insight in fewer words is preferred. Use the simplest language possible. It’s future-me talking to current-me. There’s nobody to impress here. Use any analogy that’s memorable. I’m not embarrassed by “childish” analogies. If a metaphor excites me, and helps, I’m going to use it. Nyah. Be a friend, not lecturer. I want a buddy, a guide who happened to experience the material before I did, not a pompous schoolmarm I can’t question. Point out the naked emperor. Most calculus classes cover “limits, derivatives, integrals” in that order because… why? Limits are the most nuanced concept, invented in the mid-1800s. Were mathematicians like Newton, Leibniz, Euler, Gauss, Taylor, Fourier and Bernoulli inadequate because they didn’t use them? (Conversely: are you better than them because you do?). Most courses are too timid (or oblivious) to question the strategy of covering the most elusive, low-level topic first. Learn for the long haul. The elephant in the room is that most math courses are a stepping-stone to some credential. Future-me doesn’t play that game: he only benefits when current-me permanently understands something. Let’s learn calculus intuition-first. The goal is a lasting upgrade to your intuition and storehouse of analogies. If that doesn’t happen, the course isn’t working, and it will be enhanced until it does. Sign up for the mailing list and I’ll let you know when the course preview is ready, in November.